Snack Girl knows that readers get bored with her obsession with flaming McDonald’s. You have to remember that there are people who read this site who visit McDonald’s because it is on their way to work, or they didn’t have time to make dinner, they forgot their lunch, etc. McDonald’s is here to stay and I, Snack Girl, am here to critique it. If you are a Weight Watchers member, you know how out of control 16 PointsPlus is. Yikes! How did it taste? One word: yucky. The strawberry flavor was too sweet and tasted fake because it probably is fake. How do you charge $1 for a drink like this? We all want to have an indulgence every once in a while. I get that. 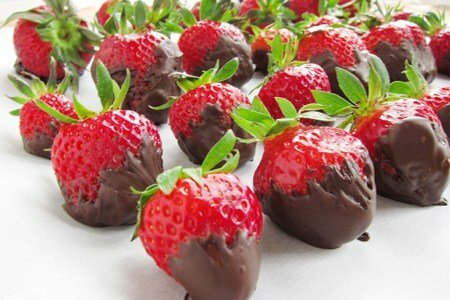 Instead of McD’s fake strawberry el cheapo shake, buy some fresh strawberries and dip them in chocolate. You can eat 16 strawberries with chocolate for the same amount of calories. Don’t they look so much yummier? There is no comparison, in my mind, between something as lovely as a fresh strawberry dipped in chocolate versus the McDonald’s Frappe. Yes, it will cost you more money. Yes, it will take you more time. But, you are worth it!! 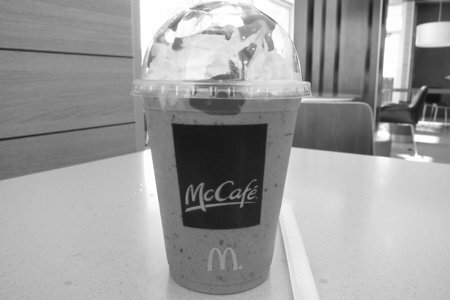 How do you deal with the McDonald’s cheap frappes? OMG! That is crazy! Who would get that stuff? WOW! I have a bit of a vanilla frappachino addiction, but Starbucks is way too expensive and the calories and fat don't mesh wit my weight watchers plan. So, over the last two weeks I have been coming up with my own recipe and I finally prefected it and let me tell you...it is AWESOME!!!! Here's my recipe for a Vanilla frappachino, let me know if you try it and what you think! It is only 4 weight watches points plus! Blend all together really well, then stir a little and blend again! Top with Reddi Whip. I don't like McDonald's at all. My down fall though is the Chai Latte from Starbucks. It calls to me when I drive past, LOL. I learned to drive another way but I do allow myself one per month. Do you watch My 600-lb Life? In almost every episode, the person was eating MASSIVE amounts of McD's prior to their surgery, and often times after. That stuff is addictive. I still dream about it sometimes. Not to mention they probably use bugs to get the pink color (like Starbucks). Down with artificial colors and flavors! Aubrie- what do those companies use to sweeten their "sugar free" Cool whip, coffee mate and vanilla sweetner? All chemicals. I stopped eating fast food over 5 years ago. I went cold turkey. It was very difficult at first, now I can't even eat it. If we are out with friends and they suggest it, I get a salad. The thought of eating fast food turns me off. We are fortunate that it has become a family decision in our household. I would never get any frappe'(although I understand why some people would) however I have gotten the oatmeal and I get it minus the sugar and cream then I put skim milk on it. Im a vegetarian and rarely eat fast food but I find that the dumpster at mcds smeels like the food and the food smells like the dumpster... not so appitizing,easy to avoid in my opinion! Wow... I guess its good I've decided to make some attempts at quitting the fast food. I've seen the stuff of chicken nuggets pre molded/cooked. unsavory looking. *ew* if thats the chicken i don't want to see the beef. I would never have that ..17 grams of saturated fat ! What are the chemicals that go along with it ? Hello all! In response to you, Andrea, regarding the comment about my recipe. You certainly are right and I totally see where you are coming from. In my defense I have lost 80 lbs this year and need to make my own recipes like this for the occasional time I am tempted to get a way too expensive coffee drink :) I do appreciate the concerns about chemicals and such, but for me right now I am focused on calories and fat. I know everyone has their own way of doing things, and appreciate that, but I didn't put this recipe up to be judged, just wanted to share for those that might appreciate it. Thanks! Jacki - maybe including your 8 year old in the menu planning and/or food prep would help. A better column would be a comparison between the Frappe, the standard milkshake (Calories 550, Fat 16 g, Carb 90g, Protien 12g, Sodium 160 mg) and one of the Strawberry Banana fruit smoothies (Calories 210, Fat.5 g, Carb 47 g, Protien 3 g, Sodium 50 mg) For a cold sweet treat I'll have the smoothie. I agree about the shake Wow! But I do get my coffee from them every morning on my way to work. Medium Black. I think their coffee is not bad for the price. That's what I get at McD.,hope they don't take that a way. Aubrie congratulations on your weight loss! That is awesome! Sorry if that came across as rude, not my intention. I do know that Snack Girl has dedicated her website to promoting "real" food so I felt the need to point it out. Congratulations on your success Aubre!!! You are absolutely correct, you need to find what works for you otherwise you won't stick to it. I have lost 70 lbs & maintained it now for over 5 yrs. Keep doing exactly what you know is best for your & body/mind. I bet you look amazing inside & out!!! I like dunk my strawberries in Jello sugar free Chocolate pudding cups!! YUM! !